Cloud computing is a way of accessing a variety of IT infrastructure and services without needing to have them physically in your home or office. All you need is an internet connection and you can access all your enterprise files and software via a web browser. For small businesses, using cloud-based products can remove some of the hassle associated with maintenance and upkeep, but it's important to understand what you're signing up to. Let's look at what cloud computing means in plain English, and how it can benefit your organisation. Cloud computing is everything you already know computing to be, but with the hardware normally on your business site, such as servers, located elsewhere and managed by somebody else. You can connect to infrastructure remotely, from any location and at any time. Connect to hardware, software or infrastructure remotely, from any location. Don't want to own and house a server? 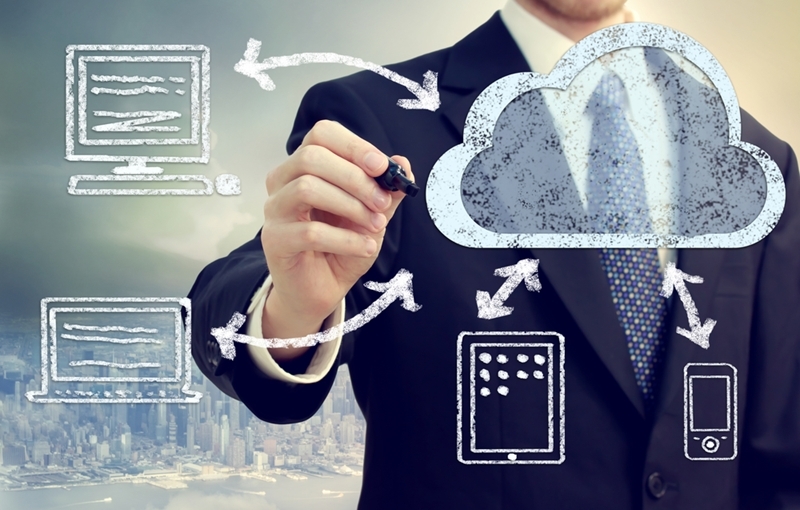 No problem – expert cloud service providers have ones to use, and they'll make sure it works. Need a filing system your staff can access across multiple offices – why not store your documents in the cloud instead? Many cloud-based software packages require little, if anything, in the way of set up. Installation disks and licenses are long gone. Many providers are able to get you started almost immediately. It's also easy to increase, or decrease, your cloud requirements. Should you need more storage space in the future, there's no need to buy more hardware – just notify your provider to increase your access. Cloud computing provides a way for small businesses to manage documents, hardware and infrastructure remotely. Some forms of cloud computing are easy to access and set up on your own. You probably already use cloud-based email software, or use cloud storage to back up photos online. However, just like localised computing, if you don't have the knowledge to set up your own servers or networks, you may need to buy into a managed solution. Whether they're in your office or not, your servers, emails and infrastructure still need updating and protecting. A managed solution means someone else keeps your network running in the middle of the night, and fixes issues immediately. Without a managed solution, you'll be limited to what the cloud provider offers as part of its package. Most small businesses rely on one of these options to create and share documents. With a full cloud service, you don't need the programme on your individual computer to access or create documents. You can store information on the cloud and continue working with it from any device. With cloud-based software solutions you don't need to carry a particular laptop around between meetings. CRMs and marketing software is essential for small businesses. For sales team out in the field, having client data at their fingertips is crucial. With cloud-based software solutions such as Salesforce and Mailchimp, you don't need to carry a particular laptop around between meetings. Access software from anywhere with an internet connection to provide the best customer service and keep your business moving. You no longer need a collection of hard disks, CDs or USBs. Large files uploaded to the cloud are accessible by colleagues across the company, no matter their location, immediately. It saves storage space on office devices, and even when you upgrade your laptop, everything is just where you left it. If you're wondering if your business could benefit from cloud computing, consider our SME cloud services assessment.